I know that summertime is really here when the wonderful stone fruit start to be plentiful and cheap. Peaches, nectarines, apricots, plums, cherries – hooray! Meanwhile I’ve bought about seven kilograms of stone fruit in the last week. I can’t resist it. I picked up four kilograms that was super cheap as the fruit was a bit dinged up in a few places. Once soft fruit gets damaged like this in warm weather, it will rot very quickly. I’ve had precious white peaches turn into fuzzy science experiments on the benchtop in just hours. But I raced these ones home and stewed them immediately. I now have several containers of stewed apricots with vanilla, and peaches stewed with slivers of orange peel. 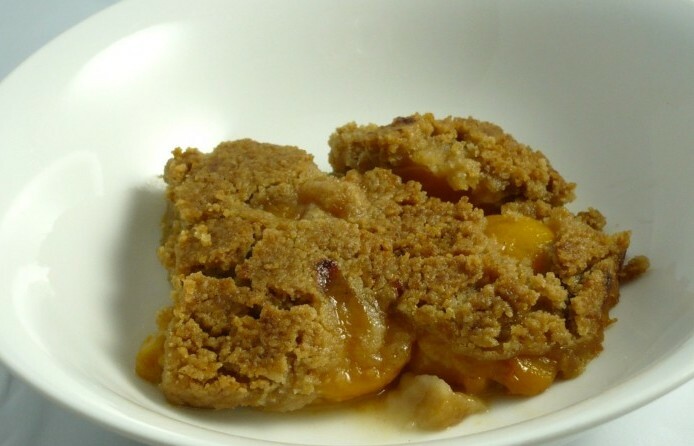 Some are in the freezer for later when the fruit is out of season and some in the fridge for using now. I’m sure I’ll be making more as the summer wears on. One of my favourite breakfasts is fresh or stewed fruit with almonds and coconut yoghurt. 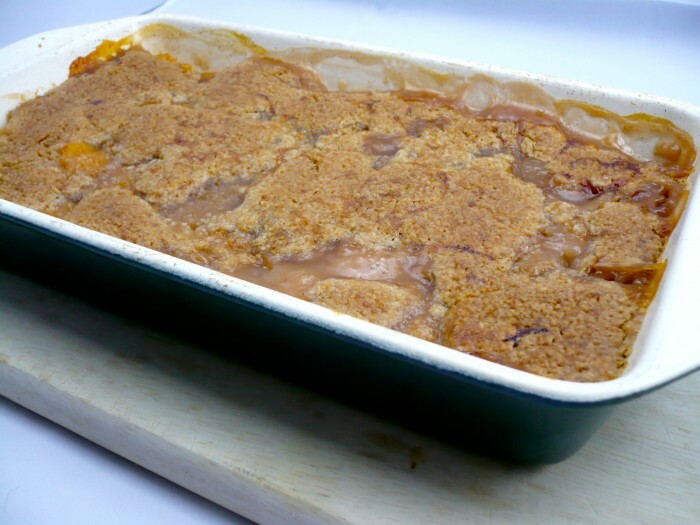 But one of my other favourite things to do with stewed fruit is a fruit crisp. I’ve been making this dessert by Deborah Madison since the eighties. That is scarily a long time ago! I love Deborah Madison’s food. Her books are vegetarian, but easily veganised, and she has a knack with fruit and vegetable flavours and combinations that is genius. Some of the dishes in my regular repertoire are from her books. It also takes a great cook to make me want to read cookbooks that have no pictures! This recipe comes from the dessert section of The Savoury Way. Of course I’ve tinkered with it over time as I can’t help myself. The original uses fresh fruit, I use fruit that is already cooked. I use less sugar than the original and of course I’ve veganised it by replacing the butter. This dish is easy to make and I think it tastes like something that took more effort than it actually did. It is delicious as dessert and the leftovers are nice as breakfast too! You can make it with canned fruit and it works well, though it is much better with fruit that is really ripe when cooked, which canned fruit never really was. It can be a bit of an ugly duckling though. The topping can end up a mix of crispy, shortbready, caramelised, burnt and jammy and even gluey in parts. I like all this variation. It can depend on a number of things from the freshness of the flour, to how much coconut oil you use, to how much liquid is in the fruit underneath, to the alignment of the planets. If you like it bubbling and jammy then use more liquid, if crisper then make sure the fruit layer is pretty dry. You can use more or less coconut oil, up to a maximum of 3 tablespoons. If this all sounds offputting, don’t worry. The dish has never been exactly the same any time I have made it, for me that is part of the charm. I’ve swapped out the butter for coconut oil and I think this is one of the reasons that the recipe is slightly less reliable than when I used to make it in my pre-vegan days. Coconut oil just doesn’t behave exactly the same as butter in baking. Feel free to substitute your favourite butter substitute. The plus is that unrefined coconut oil is perfect here because it adds a slight coconut flavour that goes well with the fruit. And if you can keep some of the summer fruit in the freezer long enough, you can enjoy the dessert and create a small bit of summer in the dead of next winter. 2-3 tablespoons unrefined coconut oil. Feel free to use your favourite non dairy butter substitute. It needs to be cold and solid so it can be rubbed in. Rub the coconut oil into the flour mix until the mixture resembles breadcrumbs. Spread the fruit into a shallow baking dish, and make sure there is not too much liquid in there or it will end up like glue. My baking dish is 20cm x 20cm. Spread the flour mix over the top of the fruit and pat down gently. Don't worry about the evenness too much, where there are holes in the topping anyjuices from the fruit will bubble up and caramelise. Even more delicious. Cook in the oven at 180 deg C for 30-45 minutes or until golden. Serve warm as is or with some coconut yoghurt. If you are disappointed by this dish, don't hesitate to make it again. The outcome can vary based on the freshness of the flour how much coconut oil you use and most importantly how wet the fruit is. I like this dish in all its moods, so I am happy however it turns out. Jammy, cake-like, shortbready, even occasionally stodgy!